Sweet K Cookies owner Kristin Foristall (left) shows her cookie bouquets to WHDH-TV’s Sarah French. 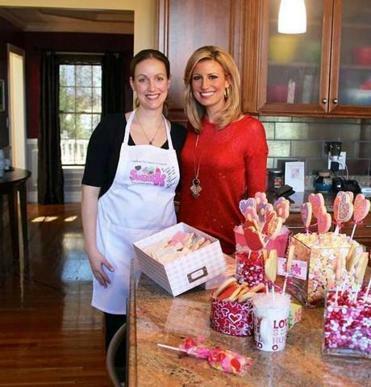 Television viewers can learn how to make an easy and delicious gift for their valentine Thursday night when Channel 56 airs Sarah French’s visit to Sweet K Cookies in Reading as part of the WHDH series “The Dish.” . Kristin Foristall, 36, who started Sweet K three years ago, showed French how to bake and construct cookie bouquets during a taping in the owner’s home kitchen last month. The how-to will air Thursday night on Channel 56 during “7 News at 10.” It will be rebroadcast on Channel 7 Friday during the 9 a.m., noon, and 5:30 p.m. news. Foristall walked French through the steps of making dough, baking the cookies, and constructing and decorating the cookie pops. She said bakers can add a personal touch with varied frosting and sprinkle combinations and the cookie cutters they use: She suggested lips, hearts, or flowers for Valentine’s Day. Cookie creators also can get crafty with their choice of containers and the candy that holds the cookie pops upright. Foristall said that during the taping she made homemade icing and cookie dough from scratch that she usually chills for about four hours. However, she said anyone can make cookie bouquets with store-bought cookie mix and canned icing. She added that instructions will be on “The Dish” website after the episode airs. As for Foristall’s Valentine’s Day agenda, she said she plans to bake a sugary treat for her special someone.